SOHO Organizer is the official successor to Personal Organizer and Group Organizer and represents a 100% Cocoa rewrite of the former products. This means SOHO Organizer presents a first-class Mac OS X experience complete with all the features Mac OS X users expect: Aqua interface, Unicode compliance, built-in spell checking, Service support, etc. Finally, the true benefit of a complete Cocoa rewrite is that SOHO Organizer is built for the future and can easily accommodate future technologies (think Intel-based Macs). SOHO Organizer makes managing customer relationships from phone calls and notes to appointments and to-dos easy. It embraces and leverages popular Mac OS X technologies and applications instead of trying to replace them. For example, it synchronizes seamlessly with the Address Book and iCal so that users can continue to use them and other applications that rely on their data. 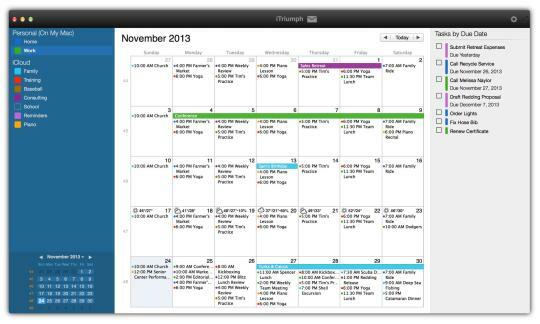 Users can thus use Apple's iSync to synchronize their contacts and calendars in SOHO Organizer to cell phones, iPods, Palm handhelds, and even .Mac.